With recovery audit contractors (RACs) hot to recoup hospital Medicare payments, inpatient coders are under even more pressure to submit errorless work while at the same time leaving no legitimate money on the proverbial table. If you missed For The Record’s May 1, 2006, article on the technicalities of how to code excisional debridement, this is an excellent time to brush up. Because debridement is a significant RAC target, it would be financially injudicious to wait until after your facility has had to give back a pile of money before you pay close attention to the bevy of rules involving the correct use of this one little code. This article includes updated Coding Clinic directions that have been published in the interim and spotlights the targets RACs focus on. If you are confused by the changing—and even conflicting—rules regarding how to code debridement in ICD-9-CM, you are far from alone. The first challenge is to get the physician to document what tissue is being debrided. Then, with luck and queries and perhaps even flat-out begging, the physician may specify whether the debridement was excisional or nonexcisional. Even the term “excisional” causes debate among the physician staff. Many will use the terms “sharp debridement,” “surgical debridement,” and “excisional debridement” interchangeably. Their personal perceptions of what that means, however, can vary greatly. Some will even apply a generic incision and drainage term to all types of wound treatment, never dreaming that all will be assigned to incision and drainage codes without further specification. Some will be certain that any of the above, if performed in a surgical suite, must be qualified for the higher diagnosis-related group (DRG) assignment. To further add to the confusion, not all cutting of tissue automatically qualifies for the code 86.22, Excisional debridement of wound, infection, or burn. The AHA Coding Clinic for ICD-9-CM information from 1988 to 2005 clearly specifies that the code applies to the surgical removal or cutting away rather than scrubbing, scraping, brushing, washing, or snipping away bits of tissue with scissors. Because the inpatient account with a DRG payer is significantly impacted by whether the procedure was excisional, the savvy facility will do whatever it takes to get that clarification prior to coding and billing. Initial confusion dates back several years to a time when a facility could include a code for excisional debridement only if a physician performed the procedure (AHA Coding Clinic for ICD-9-CM, 1988, fourth quarter, page 5). In general use, the term sharp debridement was synonymous with excisional debridement and would generate a surgical DRG. This has remained a stumbling block for auditors, many of whom are nursing staff rather than DRG coders. They tend to expect that a surgical DRG should be derived from a procedure that needs to be done in, well, surgery. This misconception has caused many a denial, and the clinical logic is difficult to refute no matter how incorrect it may be. In truth, the excisional debridement can be done in the operating suite, at the bedside, or in the emergency department without affecting the final DRG and associated payment category. We must remember that a DRG is not based on the clinical severity or intensity of service for any single patient. Rather, the DRG payment system is based on the average cost of taking care of that particular patient population. Once we view it in that fashion, it makes more sense. A patient with a decubitus ulcer that is so severe it requires excisional debridement is likely to stay in the hospital significantly longer than one who only needs a round of antibiotics and Silvadene with regular dressing changes. We must also consider the situation when a patient with an extensive wound or ulceration requires debridement through several layers of tissue. What determines the code (or codes) to be used? Here again, there is no easy answer. If two sites require excisional debridement, two codes can be used. For instance, if a left leg ulcer requires excisional debridement down to and including muscle and the right leg ulcer only needs excisional debridement of skin and subcutaneous tissue, it would be correct to assign two codes. The deep procedure on the left leg would be assigned 83.45, Other myectomy, and the less severe right leg would be assigned 86.22, Excisional debridement of wound, infection, or burn. On the other hand (or in this case, leg), if only one site is debrided, then a single code, determined by the deepest tissue that is excised, is used. Thus, if a single leg ulcer was excisionally debrided and included the removal of skin, subcutaneous tissue, fascia, muscle, and even bone, the only code assigned would be the excision of lesion of the specific bone(s) (AHA Coding Clinic for ICD-9-CM, 1999, first quarter, pages 8-9). Added to the challenge was the need to code laser debridement as technology advanced. However, AHA Coding Clinic for ICD-9-CM was on hand to clarify that issue (1989, third quarter, page 16). Laser debridement was to be considered excisional debridement and coded accordingly by indexing the tissue and site of the procedure. In 2000, a change and a clarification were made in the coding rules for this procedure. The coder was now allowed to include the code for excisional debridement by any healthcare provider. Specific permission included those performed by a nurse, therapist, physician assistant, or physician. Escharotomy was reindexed from 86.22 prior to October 1 of that year and moved to 86.09, Other incision of skin and subcutaneous tissue. This seems more appropriate because the suffix-otomy indicates an incision rather than excision. The latter would be indicated by the -ectomy suffix. Exceptions are the rule, not the exception, in too many cases. Just when we think we finally have the hang of coding this slippery procedure, we find there is even more to consider. If the excisional debridement is of a graft, a pacemaker or defibrillator pocket, or a nailbed, the procedure code can vary once again. Careful review of the index must be included to make sure the code is selected from the correct section, as not all excisional debridements of skin will be assigned code 86.22 since some are site specific as well. Open fractures that require any debridement will not be directed to 86.22, either; they will be directed to a code for debridement of the fracture site. Amputation stumps that require further attention in the way of excisional debridement may or may not be assigned to code 86.22. The deciding factor is the extent and type of tissue involved in the procedure. As directed in AHA Coding Clinic for ICD-9-CM, 2005, first quarter, pages 14-15, excisional debridement of skin and subcutaneous tissue of the amputation site could still correctly be assigned code 86.22. To be considered a revision of the amputation stump (84.3), the procedure should include a resection of the bone itself. 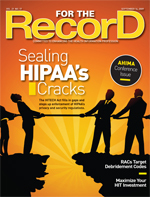 The significant DRG reimbursement errors that can result from the improper use of debridement codes has made code 86.22 a prime target for RACs. AHA Coding Clinic for ICD-9-CM continues to receive requests for clarification of the difference between 86.22 and 86.28, and it is unfortunate that the most recent injury and poisoning coding guidelines from October 1, 2008, are not more helpful. Their redundant explanation is as follows: “Excisional debridement involves an excisional debridement (surgical removal or cutting away), as opposed to a mechanical (brushing, scrubbing, washing) debridement.” According to the tabular of the ICD-9 code book, both codes include “removal of devitalized tissue, necrosis and slough,” but 86.22 specifies that the method must be excisional. Page 4 of the first quarter 2008 Coding Clinic validates that if a physician’s documentation in a progress note states that excisional debridement was carried out, the coder is correct to use 86.22, Excisional debridement of wound, infection, or burn. Remember, however, that there are still dozens of exceptions depending on site, tissue, and methodology. The coder must read the entire operative report if one exists; the body of the report can contradict the title of a procedure, especially at facilities where physicians have been queried extensively on this issue. For example, if the physician titles the report “Excisional Debridement” but it clearly describes only incision and drainage, the coder must query for further clarification in order to correctly assign a procedure code. According to additional Coding Clinic instruction on this page, if the physician states the debridement is “to the bone,” then the code is to be defined as “of the bone,” and code 77.69 would be used instead of 86.22. On pages 8 and 9 in the same issue, there are updated coding directions to code only the excisional debridement if both an incision and drainage and an extensive excisional debridement are performed. Note also that this direction is reliant on the terminology used by the physician in order to assign the code. As guided by the index of the codebook, Removal, skin, necrosis, or slough, excisional is coded to 86.22 correctly, with the term excisional being the final determining modifier. In summary, all we need is specific documentation of the site, the tissue excised, the extent of the procedure, legible handwriting, careful review of the index and tabular of the ICD-9-CM code book, and a comprehensive knowledge of the rules and exceptions. If we can perfect this combination of skill and knowledge, we’ll avoid the chief financial officer’s wrath for missing reimbursement on our DRG patients, and we’ll have compliance’s blessing for keeping the facility’s coding clean and legal. And we’ll also keep RACs satisfied.